Aaron Rodgers is a superstar quarterback for the Green Bay Packers. After Brett Favre announced his retirement in 2008, Rodgers quickly proved he was among the elite after throwing for 4,000 yards with 28 touchdowns. He earned his 1st Pro Bowl selection in 2009, and led the Packers to the Super Bowl in 2010. 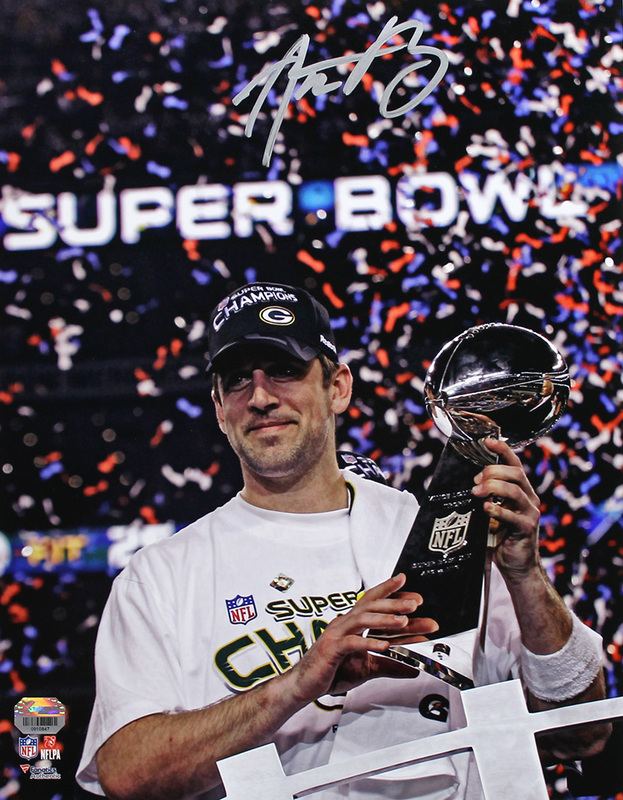 The Packers won Super Bowl XLV, and Rodgers was named MVP of the game. The 5-time Pro Bowler has earned the NFL’s Most Valuable Player award twice, in 2011 & 2014. Rodgers has set numerous NFL records, including most touchdown passes of 70 or more yards with 16, as well as the best touchdown to interception ratio in NFL history. This Green Bay Packers Super Bowl XLV 11x14 photo has been hand signed by Aaron Rodgers. Each autograph is guaranteed authentic, and includes an individually numbered TRISTAR Authentic hologram, as well as authentication from Fanatics.